Looking for a New Hyundai Santa Fe XL in your area? CarGurus has 886 nationwide Hyundai Santa Fe XL dealers with 15,902 new car listings. Hyundai’s Santa Fe series consists of two models: a smaller, two-row crossover and a larger, three-row one. The two-row model, formerly known as the Santa Fe Sport, is all-new for 2019, so the larger model has been renamed Santa Fe XL for the 2019 model year. Apart from the name change, the 2019 Santa Fe XL remains relatively unchanged from previous years. Although the Santa Fe XL is only a mid-size SUV, it can still accommodate up to seven passengers in comfort. 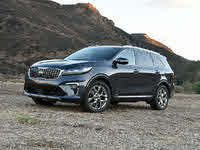 The crossover’s styling offers just a hint of adventure by way of matte black lower cladding, and its classic design still looks good several years after its debut. 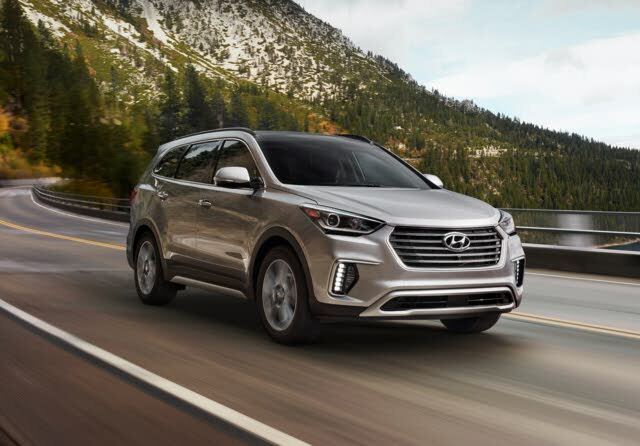 All Santa Fe XLs are powered by a 3.3-liter V6 engine that makes 290 horsepower and 252 pound-feet of torque, which sends power to a 6-speed automatic transmission. Front-wheel drive (FWD) is standard, but all-wheel drive (AWD) is available across all three grades. Fuel economy has not been officially announced for the 2019 model yet, but it shouldn’t differ widely from that of the previous year, which was 18 miles per gallon city, 25 highway, and 21 combined. Hyundai doesn’t penalize its cost-conscious buyers, so even lower trims come with plenty of chrome. Inside, the XL’s design is a bit more dated, but it offers plenty of versatility. The second-row seats can slide, and the third-row seats fold in a 50/50-split arrangement. The Santa Fe XL carries on with its previous SE, SE Ultimate, and Limited Ultimate trims. SE comes equipped with 18-inch alloy wheels, stain-resistant cloth upholstery, heated exterior mirrors, LED daytime running lights, satellite XM radio, dual-zone climate control, USB connectivity, and a 7-inch touchscreen infotainment system with Apple CarPlay and Android Auto. On top of that, a Premium Package for SE adds a hands-free liftgate, front LED fog lights, mirror-mounted turn indicators, a power passenger’s seat, leather upholstery, a leather-wrapped steering wheel, an auto-dimming rearview mirror, and a color instrument panel LCD. Finally, the Limited Ultimate swaps out the second-row bench seat with captain’s chairs, making the Santa Fe XL a comfortable six-seater, and it gets a unique exterior trim, ventilated front seats, and navigation. The Tech Package is also available for the Limited Ultimate. The SE Ultimate includes everything from the SE’s Premium Package along with upgraded 19-inch wheels, driver’s side memory settings, Infinity premium audio, an 8-inch infotainment system with Apple CarPlay and Android Auto, and a 115-volt power outlet. The Tech Package tacks on an electronic parking brake with auto-hold, adaptive HID headlights, and high-beam assist. Safety-wise, the Santa Fe XL has a full complement of features designed to protect and prevent accidents. SE comes with a reversing camera and a driver’s side blind-spot mirror. Blind-spot monitoring, rear cross-traffic alert, lane-change warning, a multi-angle camera system, and rear parking sensors are bundled with the SE Premium package and come standard on other trims. Meanwhile, the Tech package for SE Ultimate and Limited Ultimate adds adaptive cruise control and automatic emergency braking with pedestrian detection. The Insurance Institute for Highway Safety (IIHS) last tested the model in 2018, where it was designated a Top Safety Pick Plus. What's your take on the 2019 Hyundai Santa Fe XL? Lynn I want one and am getting impatient for them to arrive!!!! CharlieNY Hi Bill, I lease a 2016 Hyundai Santa Fe Limited Ultimate, and scheduled to return the vehicle in March 2019. I am waiting for information on the XL and nothing forthcoming. The new lineup - replacing Sport with Santa Fe with 2.4L engines is a turn off for me. If getting the XL out is a challenge, I am forced to look for other competitor options. I dont want to as i really like the 6 seater Santa Fe's but at this point i have to do what i must. Have you driven a 2019 Hyundai Santa Fe XL? Enter your zip to see incentives for a new Santa Fe XL in your area. CarGurus has 4,003 nationwide Santa Fe XL listings starting at $22,864. I Cant Find The Regal Red Hyundai XL Any Where In Texas. What Can I Do? What does trailer prep package on 2019 Hyundai Santa Fe XL consist of? What do I need to install brake controller and 7 way to tow a trailer? Thank you.